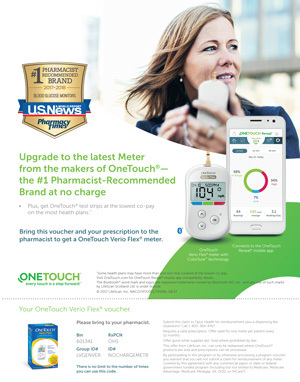 This blog has been compensated by OmniChannel Health Media and its advertiser. All opinions are mine alone. If you are looking for a helpful resource to help you maintain healthy blood glucose levels and heart health, look no further than your local Costco warehouse. The Costco Diabetes & Heart-Healthy Shopping Tour is a free guide at cdiabetes.com/guide. This free guide provides an overview of the healthy products available at your local Costco warehouse. As a pharmacist and diabetes educator, I am impressed by this guide and have used it to learn about the healthy foods and dietary supplements that can be purchased at Costco. With the Costco Diabetes& Heart-Healthy Shopping Tour, I can make smart choices about my own health, and I can help my patients and colleagues improve their health. Costco’s vitamin section is in the front of the pharmacy. You’ll find many dietary supplements that may be helpful in managing diabetes or maintaining healthy blood glucose levels. If you have questions about what products might be right for you, your Costco pharmacist can assist you. Make your Costco pharmacist an important part of your diabetes health care team. CinSulin contains Cinnamon Bark Extract, Chromium and vitamin D3. The cinnamon used in CinSulin is extracted from cinnamon bark with water, heat and pressure. CinSulin is safe and effective, and studies show it contains the same benefits as whole cinnamon without the allergic reactions or mouth pain that some people get from consuming whole cinnamon. CinSulin is mostly safe when used with other dietary supplements or medicines. However, you should use caution if you also take prescription medicines, over-the-counter products, or dietary supplements that lower blood glucose levels. Speak to your healthcare provider to see if CinSulin is right for you. CinSulin, like other dietary supplements, is not intended to prevent, cure or treat any disease. CinSulin is not meant to be a substitute for healthy eating, exercise or medicines used to manage your diabetes. Please speak to your health care team, including your Costco pharmacist, before taking any dietary supplements, including CinSulin. The contents of the CDiabetes.com site, such as text, graphics, images, and other material contained on the CDiabetes.com site (“Content”) are for informational purposes only. The Content is not intended to be a substitute for professional medical advice, diagnosis, or treatment. Always seek the advice of your physician or other qualified health provider with any questions you may have regarding a medical condition. Never disregard professional medical advice or delay in seeking it because of something you have read on the CDiabetes.com site. *These statements have not been evaluated by the Food and Drug Administration. This product is not intended to diagnose, cure, treat or prevent any disease.